- Publisher Relentless brings the true nature of terrorism to light. When Israel pledged to pursue peace with long-time foe Yasser Arafat and the PLO, the world breathed a sigh of relief, believing this was the birth of true peace in the Middle East. Pundits and politicians alike toasted the Israelis and their new-found peace partners, the Palestinian National Authority. What wasn't generally recognized was that Arafat, an arch-terrorist since his youth, had no intention of keeping his commitments. Speaking to his own people in Arabic, and to the West in English, Arafat revealed a dangerous double-game: pacify his hosts at the United Nations while directing a vast terror war against the Jewish state. 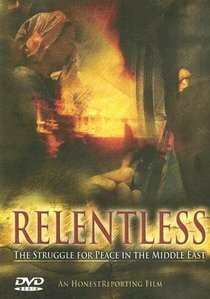 Relentless brings the true nature of terrorism to light. When Israel pledged to pursue peace with long-time foe Yasser Arafat and the PLO, the world breathed a sigh of relief, believing this was the birth of true peace in the Middle East. Pundits and politicians alike toasted the Israelis and their new-found peace partners, the Palestinian National Authority. What wasn't generally recognized was that Arafat, an arch-terrorist since his youth, had no intention of keeping his commitments. Speaking to his own people in Arabic, and to the West in English, Arafat revealed a dangerous double-game: pacify his hosts at the United Nations while directing a vast terror war against the Jewish state.